In 1938 Master Morihei Ueshiba, the Founder of Aikido, finalised the 2nd of his 3 technical texts. Titled “Budo“, the text contains a sampling of techniques from a wide range of attacks, including grabs, strikes and attacks from different weapons. “Budo” is an important reference point for our practice at the dojo. The below video features a photographic demonstration of jo tori rokkyo (Technique 41) as it appears in “Budo“. Rokkyo is an Aikido arm bar technique and is commonly used to disarm a uke who has a weapon (in this case a wooden staff referred to as a jo). Also included in the video is a demonstration of the technique by Morihiro Saito Sensei who was a direct student of the Founder for more than 20 years. In the below video, Peter Brady Shihan (7th Dan Aikikai) provides instruction on jo tori rokkyo consistent with that shown in the “Budo” text. While Brady Sensei is not part of our school, his method of application is the same as that practised in our dojo. In 1938 Master Morihei Ueshiba, the Founder of Aikido, finalised the 2nd of his 3 technical texts. Simply titled “Budo“, the text contains a sampling of techniques from a wide range of attacks, including grabs, strikes and attacks from different weapons. “Budo” is an important reference point for our practice. The below video features a photographic demonstration of tanto tori munetsuki kotogaeshi (Technique 33) as it appears in “Budo“. The principles underpinning the technique (aside from the disarm) are similar to the unarmed version. Also included in the video is a demonstration of the technique (including a variation with atemi) by Morihiro Saito Sensei who was a direct student of the Founder for more than 20 years. In the below video Morihiro Saito Sensei gives detailed instruction for the traditional application of munetsuki kotegaeshi. The instruction applies equally to the armed and unarmed versions of the technique. In 1938 Master Morihei Ueshiba, the Founder of Aikido, finalised the 2nd of his 3 technical texts. Simply titled “Budo“, the text contains a sampling of techniques from a wide range of attacks, including grabs, strikes and attacks from different weapons. “Budo” is an important reference point for our practice at Aikido Warrior Dojo. The below video features a photographic demonstration of tanto tori munetsuki kokyu nage (Technique 32) as it appears in “Budo“. The technique is very similar to irimi nage with the notable exception that in the demonstrated technique the nage’s hand is placed under the uke’s chin. Also included is a demonstration of the technique by Morihiro Saito Sensei who was a direct student of the Founder for more than 20 years. Interestingly, the Founder only included 3 tachi dori techniques in his 2nd text. Further, 2 of the 3 techniques are variations of tachi dori shomenuchi kokyu nage. In the first version (Technique 28) the nage enters to the uke’s right and in the second (Technique 29) enters to the uke‘s left. Notably, in both techniques the Founder always enters on the same side as his forward foot (thereby ensuring he does not move under the vertically cutting blade). The below videos feature photographic demonstrations of both versions of bokken tori shomenuchi kokyu nage as they appear in “Budo”. Also included are demonstrations of the techniques by Morihiro Saito Sensei who was a direct student of the Founder for more than 20 years. For comparative purposes, the following video includes both the pre-war (Budo) version of the subject technique and also the post war version. Both versions are practised at our dojo. The below video features photographic demonstrations of tanto tori shomenuchi gokyo as they appear in “Budo“. Also included is a demonstration of the technique by Morihiro Saito Sensei who was a direct student of the Founder for more than 20 years. In the below video, Sensei Andy Hathaway of the London Aikido Club gives a more detailed explanation of the traditional form for tanto tori shomenuchi gokyo. Of note, the term “rokkyo” is labelled on the video – this may be a mistake or merely a different descriptor used by the School. Regardless of the label, the instruction appears to be quite similar to the “Budo” version of tanto tori shomenuchi gokyo. In the below video clip, Mike Jones Sensei from NY Aiki kai demonstrates a contemporary version of tanto tori shomenuchi gokyo. Also included in the demonstration is instruction on how to take the knife from the uke following the pin. In the below video Morihiro Saito Sensei demonstrates and provides instruction for the pre and post war versions of the aikido technique ushiro ryotedori kokyu nage. The technique is categorised as a “breath throw” and is practised as a response to a traditional attack where both hands of the nage are grabbed from behind with the intent to either place a knee in the nage’s back or drag the nage backwards. Depending on the school of Aikido the technique is sometimes referred to as ushiro tekubidori zenpo nage/kokyu nage. Ushiro ryotedori kokyu nage, like all Aikido applications, can be practised from a static form (typically under resistance) or in a dynamic free flowing form (often referred to as ki no nagare). 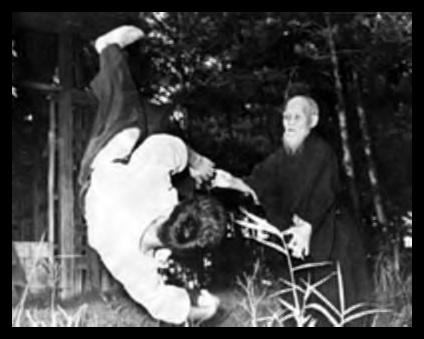 In the following video, the Founder of Aikido, Master Morihei Ueshiba (O’sensei) demonstrates a dynamic version of ushiro ryotedori kokyu nage whereby the uke directly attacks from behind and out of the nage’s line of sight (see video below). We also train this version at our dojo. In the below video Sensei Andy Hathaway of the London Aikido Club demonstrates an alternate kokyu nage application. In the below video the Koretoshi Maruyama Sensei demonstrates and teaches the subject technique as practised in Aikido Yuishinkai. This approach (including the bounce) is typical of many ki aikido schools inspired by the teachings of Koichi Tohei Sensei.